Probably one of the most loved and watched "children's stories" is the 1971 movie adaption of Roald Dahl's Charlie and the Chocolate factory, more specifically Willy Wonka & the Chocolate Factory that is easily one of the most memorable movies of all time. Not only did star the extremely talented and perfectly cast Gene Wilder as Willy Wonka but it created a cult phenomenon and even a rock band called Veruca Salt grew out of this movie. 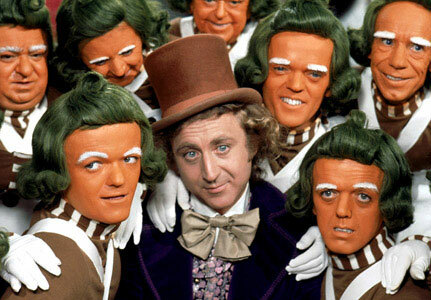 Interesting enough, the latest movie interpretation of Dahl's novel actually follows the novel more than the 1971 movie, however the psychedelic movie experience of the original and those scary or cute creatures known as the Oompa Loompas cannot be beat, hence the reason why this movie is still a 20th century classic. Directed by Mel Stuart, Willy Wonka & the Chocolate Factory revolves around a boy called Charlie Bucket (Peter Ostrum) who lives in an almost condemned house with his family, including his grandparents and overcrowding is definitely an issue. His luck soon changes when the mysterious and eccentric Willy Wonka, the creator of chocolate bars and confectionaries decides to put a set number of golden tickets into his chocolate bars and whoever discovers them will have the chance of touring his factory with one winner, having a lifetime supply of *drool* candy. As the world goes crazy eating Wonka bars in an attempt to find the golden tickets, they are eventually found by a group of children that includes Mike Teevee (Paris Themmen), a TV junkie, the classic and chubby Augustus Gloop (Michael Bollner), a boy from Germany, the obnoxious Veruca Salt (Julie Dawn Cole) and finally the super annoying Violet Beauregard (Denise Nickerson). And as fate would dictate, Charlie somehow finds the last ticket and he invites his favourite grandfather (Jack Albertson) along. Although the children who found the tickets, except Charlie are purely there for their greed, including their parents and as they tour this magical and colourful factory, they all get involved in mischief. Grandpa Joe: How could you do something like this, build up a little boy's hopes and then smash all his dreams to pieces? You're an inhuman monster! One child, Augustus Gloop gets sucked into the chocolate river for drinking it and then falling in, or another is miniaturised by one of Willy Wonka's bizarre inventions but this is the charm of the movie, especially the attitude of Mr. Wonka is who holier than thou. It's comedy, drama and a musical that made this movie so deliciously entertaining. 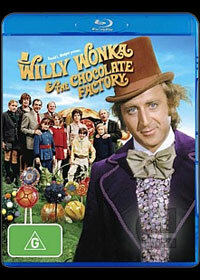 Featuring songs by those scary blue Oompa Loompas (I don't think my brother slept properly again after seeing them) and the wonderful acting by all involved, Willy Wonka and the Chocolate Factory is a movie that can still be enjoyed by everyone and surprisingly enough, it hasn't dated at all and I must admit that the special effects are still quite impressive. The Blu-ray contains a great documentary regarding the movie, commentary by the kids (which is thoroughly entertaining) and of course, some sing-alongs for the whole family to join in with. A great cherry on top... indeed! Thankfully for such an old movie, it has received a Blu-ray makeover which features sharper images, more vibrant colours and strong levels of black. Although it still cannot be compared to a movie of today, however for what it's worth, it is a very impressive transfer and at times makes the movie look even more surreal than when it was originally addressed. Willy Wonka: There is no life I know to compare with pure imagination. Living there, you'll be free if you truly wish to be. Sure it may still have its flaws, especially with the close-ups but you make the best of what you have and they surely have done it with this transfer. Purists may complain, especially techno junkies but for us, it was quite impressive.